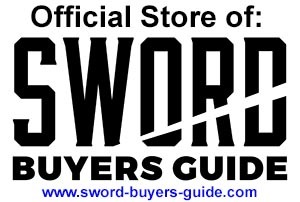 For a product to be listed in the Sword Buyers Guide Store, it has to meet and exceed certain stringent requirements. We don't stock fluff and filler - we only stock products we know, trust and would actually buy for ourselves. So naturally, when something goes wrong, we take it personally - we stand behind what we sell - and long story short, we will do what it takes to make it right, often going above and beyond the call of duty. Naturally your purchase with us covers you under the manufacturers standard warranty. Only problem with this is that when you actually read the fine print, these warranties are actually designed to protect the manufacturer against legal claims or define their right to refuse service, not guarantee YOU gets a satisfactory outcome when faced with a crummy situation like a broken sword.. But you don't have to worry about any of that when you buy at the SBG Sword Store..! When you buy through us, not only do you get the best interpretation of the manufacturers official policy (over the years we have built great working relationships with these guys and girls, they are more like family and friends than standard "business" partners) but we handle the whole process and stay with you until YOU are satisfied - achieving a better end result under the SBG umbrella than you would going it alone. But it gets even better because when you buy through us you are not only covered by the most favorable interpretation of the manufacturers official warranties and policies but get a SECOND IRON CLAD layer of protection with our..
We guarantee if you keep it well oiled and maintained, the blade of any sword sold from the SBG sword store will hold up to a LIFETIME of reasonable usage without breakage. If it breaks during the course of reasonable and intended usage we will replace it with either the same (or if unavailable, a similar) model completely free of charge. If you abuse it, like try to cut down a tree, attempt to replicate the destructive testing vids on you tube or otherwise use it in any way outside of traditional cutting techniques, we will do our best to help but the warranty is void. This warranty applies to the original purchaser (proof of purchase required) and remains in effect for as long as SBG is around to honor it. I don't think we can get any fairer - so relax and buy with confidence at SBG! We have got you covered..